When we access our strengths--what we do best--we gain access to what we call the "zone" or the flow state. In that state, we tap into parts of ourselves that are relatively submerged during normal, day-to-day life. In a very important sense, when we are in sync with our talents, we become different people. 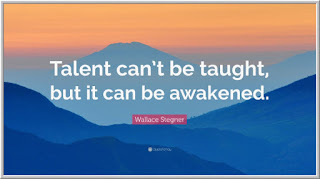 I couldn't agree more with Market Wizard Ed Seykota when he pointed out that great traders have absorbed their talent: "They don't have the talent--the talent has them." Good traders have talent--and skill and motivation and discipline. But great is a different beast. It's when the talent drives everything and the performer becomes a channel for his or her strengths. When the talents have us, we are transformed. Success depends upon our ability to effect that transformation: to go from the good to the great. The key is structuring our work so that we are continually tapping into our greatest strengths and what is most meaningful to us. We recently got to see a good example of this when Courtney Hadwin, a painfully shy and awkward 13-year old singer who placed sixth in America's Got Talent returned at age 14, wrote her own song, and competed in the Champions show. She explains, "When I sing, I become a different person." She "gets into the music", moves her body, and accesses wholly different aspects of herself. If you're trading in your normal state of consciousness, you have not awakened your talent. That doesn't win singing competitions and it doesn't win in markets.